Okowa yesterday promised to reward Eagles with $25,000 (about N9million) for each goal scored against Bafana Bafana at the FNB Stadium in Johannesburg on Saturday. Gov. 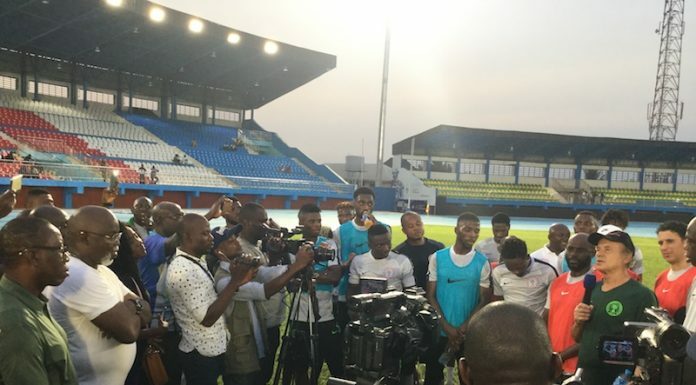 Okowa who is hosting Super Eaglesâ€™ camp in Asaba ahead of the trip to South Africa, promised the team the incentive when he breezed into the Stephen Keshi Stadium to felicitate with the players during their evening training session. â€œWe are truly excited as a state to have you train at the Stephen Keshi Stadium, we are glad that you are in Asaba and from what we can see, this is a team for today and the future. â€œThe fact that you are leaving Asaba for South Africa; we are sure you will get victory; you are doing very well and we welcome you to Asaba; as a state government, we will contribute to what you are going to do out there in South Africa, for every goal, we are going to give you $25, 000,â€ the governor said. He continued, â€œwhen you are back we are also going to host you here in Asaba. We want you to stay strong and success will be yours, because, we are a praying state and we are confident that you are going to South Africa to get a lot of goals,â€ concludes Gov Okowa. Super Eagles Technical Adviser, Genot Rohr, described the pitch as one of the best in the country while teamâ€™s stand-in Captain, Ahmed Musa, assured Gov. Okowa that Nigeria would go to South Africa and qualify for AFCON 2019. Musa and 21 other players trained at the Stephen Keshi Stadium yesterday evening as the Eagles stepped into gear for the battle against the Bafana Bafana. At the evening training session were; goalkeepers Daniel Akpeyi, Theophilus Afelokhai and Ikechukwu Ezenwa, and defenders Olaoluwa Aina, Adeleye Aniyikaye, Semi Ajayi, Bryan Idowu, William Ekong, Leon Balogun, Kenneth Omeruo and Jamilu Collins. Only France-based forward Samuel Kalu is expected to arrive camp today. Table-toppers Nigeria actually need just one point from Saturdayâ€™s encounter to be sure of a slot at next yearâ€™s continental house-party, but a combination of national pride, assumed rivalry between both teams and commitment to avenging a stinging defeat by the Bafana Bafana in Uyo 17 months ago has adorned this match with a totally different garb. The South Africans had in June last year inflicted a 2-0 defeat on Nigeria in the first match of the 2019 Africa Cup of Nations qualifier in Uyo. Although Nigeria is going into Saturday clash as Group E leaders on nine points a draw will seal Super Eagles qualification to AFCON 2019 in Cameroon. Meanwhile, Nigeriaâ€™s delegation to Saturdayâ€™s big match will depart the country aboard a chartered flight from the Benin City Airport on Thursday evening. The Eagles are expected to have a feel of the picturesque FNB Stadium on Friday afternoon by 3.30pm.